THANK YOU VERY MUCH POR YOUR EXCELENCE INFORMATION. I HAVE ONLY ONE BENEFICIARY. GOD BLESS YOU. So, you could designate multiple primaries and a trust. Yes, you may designate any person, a trust or organization to receive your death benefit. 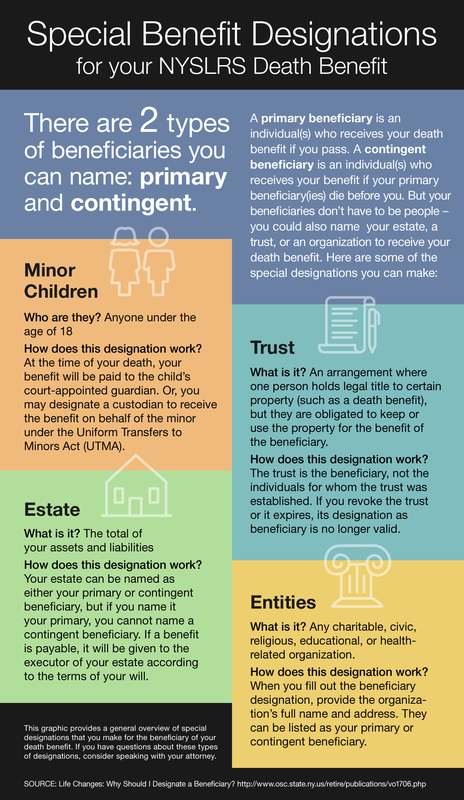 If you name more than one primary beneficiary, each will share the benefit equally, unless you indicate specific percentages are to be paid (e.g., John Doe, 50 percent; Jane Doe, 25 percent; and Mary Doe, 25 percent). With a trust, you can name your trust as a primary beneficiary or as a contingent beneficiary of your death benefit if you have executed a trust agreement or provided for a trust in your will. With this type of beneficiary designation, the trust is the beneficiary, not the individuals for whom the trust was established. If you revoke the trust or it expires, its designation as beneficiary is no longer valid. For more information, please check out our Life Changes: Why Should I Designate a Beneficiary? publication. My friend’s first wife was named as his primary beneficiary. She left NYState and has not been heard from since. A number of years have passed and he has remarried. He would like to name his present wife as primary beneficiary, as it makes sense to do so. Can he do this? NYSLRS members can name beneficiaries for several different types of death benefits depending on their plan and tier, and whether they are retired or not. For some, the beneficiary can be changed, and for some, it cannot. Your friend may be further restricted in changing beneficiaries if he has a domestic relations order (DRO) covering his pension benefits. He can find these and other details by reading his retirement plan book on our Publications page. For account-specific information, we recommend your friend email our customer service representatives using our secure email form, or call them at 866-805-0990. One of our representatives will review his account to address his questions. Filling out the secure form allows us to safely discuss personal account information. Your friend should expect a response in five to seven business days.